Swiss unions including IUF affiliate Unia are organizing to stop McDo’s tie-up with delivery service Uber Eats. McDonald’s has recently announced that Uber Eats, a branch of Uber, will deliver its burgers in Switzerland, an operation which would bypass the national collective agreement for the hotel and restaurant industry. Riders will be self-employed without any social benefits, insurance, and with wages by far below the national agreement. Unia is demanding that fast food restaurants hire their own couriers, so that the national collective agreement is applied. “With this outsourcing, McDonald’s is saving labor costs and gaining competitive advantage by using bogus self-employment. We cannot accept this in the industry “, said Mauro Moretto, Unia’s national secretary for the hotel and restaurant sector. Unia calls on the authorities to act against Uber’s violation of social and labor legislation, and proposes the creation of a national task force, which would have the task of developing effective measures to protect workers. McDonald’s workers from ten cities in the US went on strike on September 18, protesting on-the-job sexual harassment. The service sector, which includes hotels and restaurants, is the single largest zone of worker sexual harassment, with some studies indicating that 90% of female hospitality workers have experienced some form of sexual harassment in the workplace. – The formation of a committee that includes McDonald’s workers, McDonald’s corporate and franchisee representatives and representatives of leading national women’s rights groups to address sexual harassment at the company. This committee would chart a path forward to make sure no McDonald’s worker faces sexual harassment as part of the job. Burger King workers at several cities in New Zealand are balloting for industrial action following striking after a strike ballot for higher pay and better rights at work following a year of negotiations between Unite Union and the fast food chain. The union is considering expanding the strikes following the company’s failure to attend mediation talks for three weeks. According to Unite Union national secretary Gerard Hehir Burger King workers are among the lowest paid workers in the fast food industry. Store managers are on NZD 16.88 per hour, 38 cents above the minimum wage, and workers on salaries are expected to do excessive hours of unpaid overtime. Managers at McDonald’s get the living wage (NZD 20.55 as set by the Living Wage Movement Aotearoa New Zealand) and those employed by KFC, Pizza Hut and Starbucks earn “NZD 23, NZD 24, NZD 25 an hour”, Hehir said. In addition to paying workers “significantly” less than Wendy’s and McDonald’s, Burger King also had “a lot” of health and safety issues, Hehir said. New Zealand IUF-affiliated Unite Union has accused McDonald’s of deliberately denying many workers their legal entitlement for working a public holiday as determined by the Holidays Act. In 2015, Unite wrote to the company questioning how they calculated annual leave and asking them to comply with New Zealand law. McDonald’s rejected the union’s claim that they were denying workers their legal entitlements. Unite took their case to the Employment Relations Authority, the body charged with determining such disputes. In 2017 McDonald’s was inspected by the Ministry of Business, Innovation and Employment over non-compliance with the Holidays Act. Unite then made an urgent wage and time record request to the company to obtain the information needed to provide the Ministry with evidence that the company was routinely denying entitlement. The union assessed that on average each McDonald’s worker did not receive their public holiday entitlement at least twice a year at a value of approximately NZD 150 for each worker. Nine thousands workers were affected making a savings to the company of over NZD 1M through cheating workers of their legal entitlements. Unite has a long history of fighting for the rights of fast food workers in New Zealand. EFFAT-IUF, EPSU and SEIU have released a report on McDonald’s new tax practices, focusing on the company’s use of tax avoidance mechanisms in Europe and low-tax jurisdictions and havens around the world. The report shows how the company rejigged its tax structure in the midst of an EU tax probe the day after the UK voted for Brexit. In February 2015, a coalition of European and American trade unions unveiled a report on McDonald’s deliberate avoidance of over EUR 1 billion in corporate taxes in Europe between 2009 and 2013. Three years later, the update “Unhappier meal” shows how McDonald’s has significantly modified its corporate structure since the European Commission began investigating its tax dealings with Luxembourg, with the result that it is now even less transparent and more reliant on well-known tax-havens. The Unhappy Meal report outlined in detail the tax avoidance strategy adopted by McDonald’s and its fiscal impact across Europe and in major markets like France, Italy, Spain and the UK. Since the European Commission launched its state aid probe, McDonald’s has moved from Luxembourg to Delaware in the USA using a myriad of intermediate companies in Singapore, Hong Kong and the UK while making use of companies in the Cayman Islands, Bermuda and Guernsey. The new corporate structure is so opaque that the new tax base cannot be determined. The system does not allow for public scrutiny of the companies’ accounts, including taxes owed and paid. On May 1, 2018, McDonald’s workers in London, UK, will hold their second strike. The first ever strike by UK McDonald’s workers took place on September 4, 2017, IUF International Fast Food Workers’ Day, in support of demands for a minimum hourly rate of £ 10 (USD 13), an end to zero-hour contracts, and union rights and recognition. The second strike has the same demands. Earlier this year UK McDonald’s announced it would increase wages for all workers in directly-owned restaurants. The IUF-affiliated BFAWU welcomed the raise as a demonstration that workers can win when they stand together. The German Food and Allied Workers (NGG) are giving strong support to bicycle couriers fighting for their rights at the food delivery ‘platforms’ Foodora and Deliveroo, who together employ over 4,000 workers in dozens of cities. Foodora workers in Cologne joined the NGG and formed a works council last year; they were joined by Deliveroo workers in February 2018. Delivery workers are hired on short-term contracts or as bogus ‘self-employed’. They are compelled to pay their own sickness and accident insurance as well as the cost of their bicycles and safety equipment, which leaves their hourly compensation below the national minimum wage. They receive no compensation for waiting time and no compensation for accidents at work. The companies have responded to worker organizing by reducing the number of directly employed couriers and by impeding the functioning of the works council, including by refusing to renew the contracts of militant activists. A day of national action against exploitation, precarious work and union-busting at Deliveroo is planned for April 13. UK McDonald’s has announced it will increase wages as of January 22 for all workers in directly-owned restaurants, about a quarter of the company’s restaurants in Britain. The IUF-affiliated BFAWU, whose members took strike action on September 4, welcomed the raise as a demonstration that workers can win when they stand together. BFAWU members took strike action in support of their demands for better wages, union recognition and an end to zero-hours contracts and McDonald’s culture of bullying. “Our members are still demanding a real contract of employment a minimum wage for all of at least £10 and an end to the culture of bullying and harassment in the workplace”, said BFAWU National President Ian Hodson. McDonalds’ workers at two restaurants in Southeast London, UK, walked off the job in support of their demands on September 4, IUF International Fast Food Workers’ Day – the first ever strike by UK McDonald’s workers. 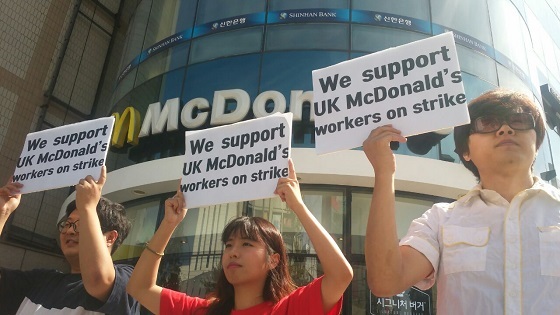 Organized by the IUF affiliated Bakers, Food and Allied Workers Union (BFAWU), McDonalds’ workers are demanding a GBP 10 (USD 13), an end to zero-hour contracts and union rights and recognition. In April 2017, UK McDonalds promised guaranteed-hours contracts to all employees who wanted them. However, the BFAWU claims that workers at most stores were told nothing about this until the strike was announced. Arbeit Workers’ Union members in Korea. 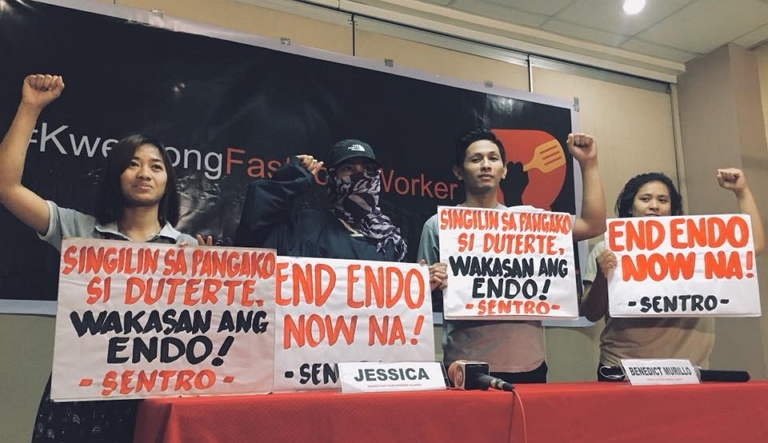 The same day, fast food workers around the globe joined the fourth IUF International Fast Food Workers’ Day with actions to show collective determination to fight poor working conditions and win better wages and union rights. Some of the many actions are visible on McJobs Facebook group or through the hashtag #FastFooodGlobal, #McStrike and #Fightfor15. 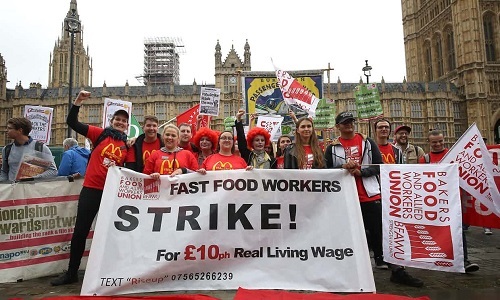 The IUF World congress, meeting in Geneva August 29-September 1, expressed its solidarity with fast food workers taking action in the UK, US and around the world.